Martin Black’s methods are based on the traditional Vaquero ways. His family has ranched for five generations on the open range of the Great Basin. Back then, everything was done for a reason and good stockmanship was the only way to get more done with less. Martin has spent over 40 years working cattle and horses in this manner and his ability to teach confident performance with minimum stress is seldom matched. A successful competitor in Cow-Horse, Camp Drafting, Saddle Bronc, Rodeo and Ranch Roping events, Martin has also worked with leading Cutting, Reining, Cow Horse and Race Horse competitors. How do you describe the Martin Black Ranch School? Maybe it’s easier to describe what it’s not. It’s definitely not a dude ranch; we don’t wait until your massage is over before we head out for the day. We are out at daylight when the weather is cool and its easiest on the cattle. It’s definitely not your normal “clinic”; you don’t sit around over cups of coffee talking about how it might be done or just watching your clinician demonstrate. A Martin Black Ranch school is all about the hands on. If you’ve been roping your dummy long enough that you’re dreaming about the real thing, this is where you need to be. Drawing on Martin’s 40+ years of practical experience, you and your horse will be taught the how, why and where of working cattle. This will be real life, practical horsemanship. During the Ranch School, Martin will ensure that you and your horse learn how to recognize the cattle’s flight zone and balance point to allow you to work cattle effectively and calmly. You will sort cow/calf pairs from the rodear, move cattle over open terrain, participate in branding and have plenty of opportunities for Martin to fine tune your horsemanship. 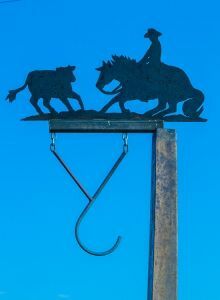 If you’re interested in roping, this is an excellent opportunity to improve your roping skills on livestock. Roping doesn’t have to be dangerous. With the right teacher, it can improve your horsemanship, be challenging, fun and addictive! During the Martin Black Ranch School you’ll gain confidence as you head/heel calves at the brandings and learn how to be efficient help on the ground. We will be roping approximately 700 calves during the month long school. 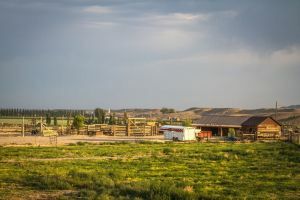 To get the most out of the Martin Black ranch experience you and your horse will need to be able to move out confidently through brush, over uneven terrain. Roping skills are not required. Wherever you are at in your Horsemanship/Stockmanship journey, this experience will take you to the next level. May 22 – June 18, 2019 – Limited to EIGHT students only. (Private room, plus board and hay for horses an additional $690 to be paid to Hot Creek at time of school). Horses and tack are available for lease; ropes and other traditional equipment are available for purchase on site.